Chicken is so versatile, yet there are times when I simply am not sure what I want to do with it. That’s how this recipe came about! 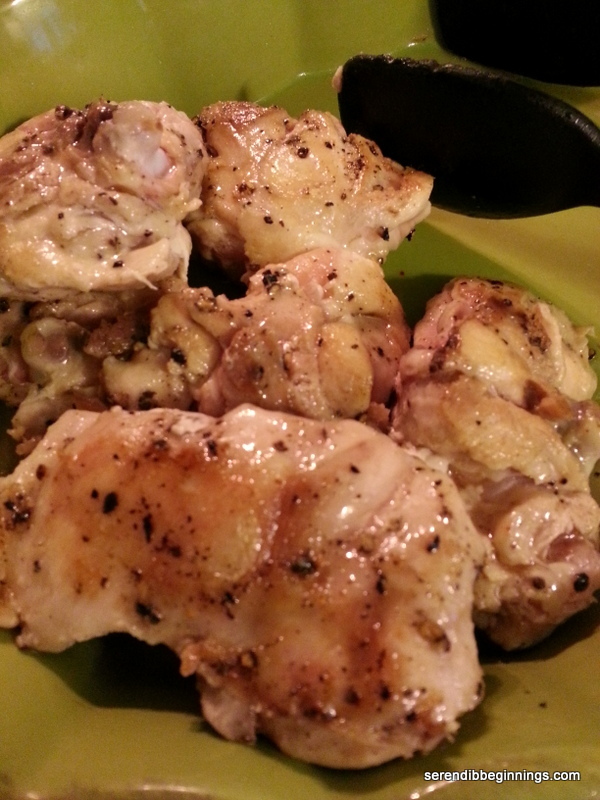 I had a package of chicken thighs and had less than an hour to get dinner on the table. What do I do with it? This dish with a wonderful citrus and garlic notes with just the right amount of a light sauce was amazing with a slice of a crusty bread. 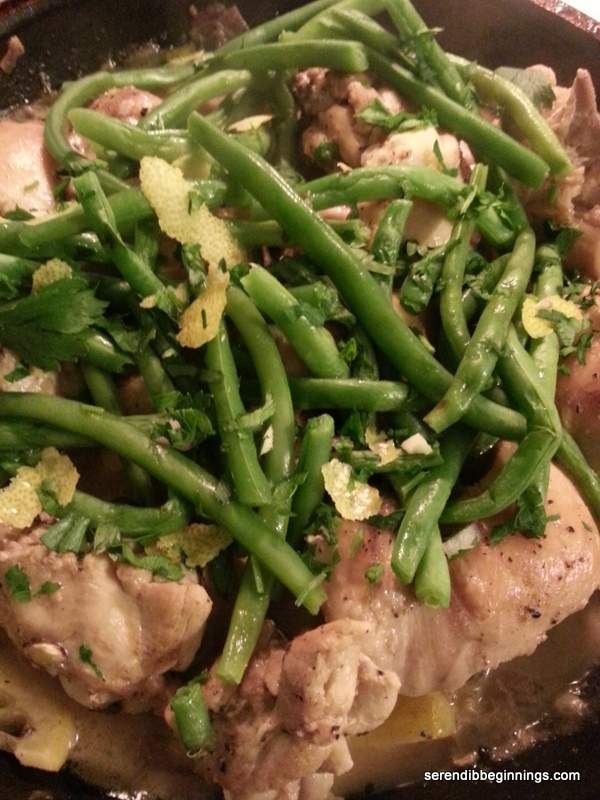 Since I had incorporated some green beans right into the chicken dish, it really was a wholesome meal. I would certainly like to prepare it again, but this time cook in the oven. If any of you try this in the oven (I would say 375F for about 45minutes or so – check for doneness), do drop a note below to say how it turned out. 1. 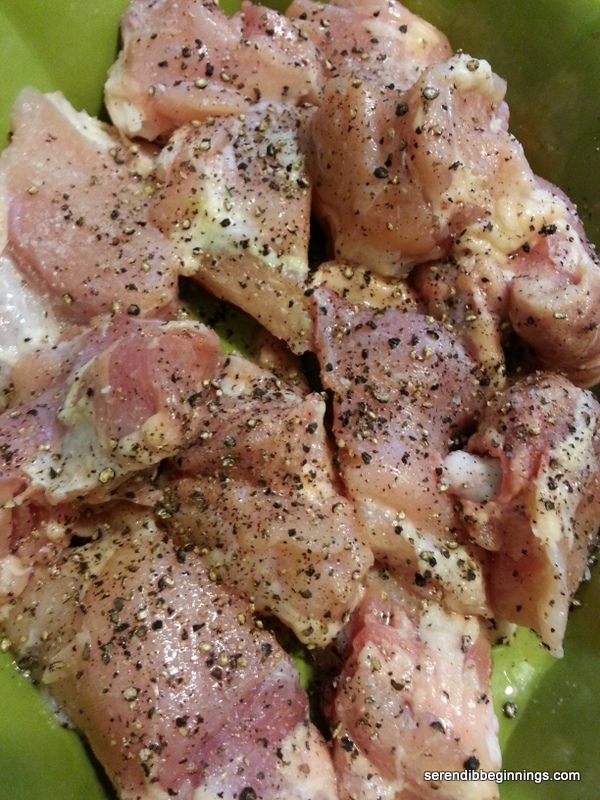 Cut chicken thighs into 2-3 pieces and season with salt and pepper. 2. Slice half the lemon into thin slices. 3. 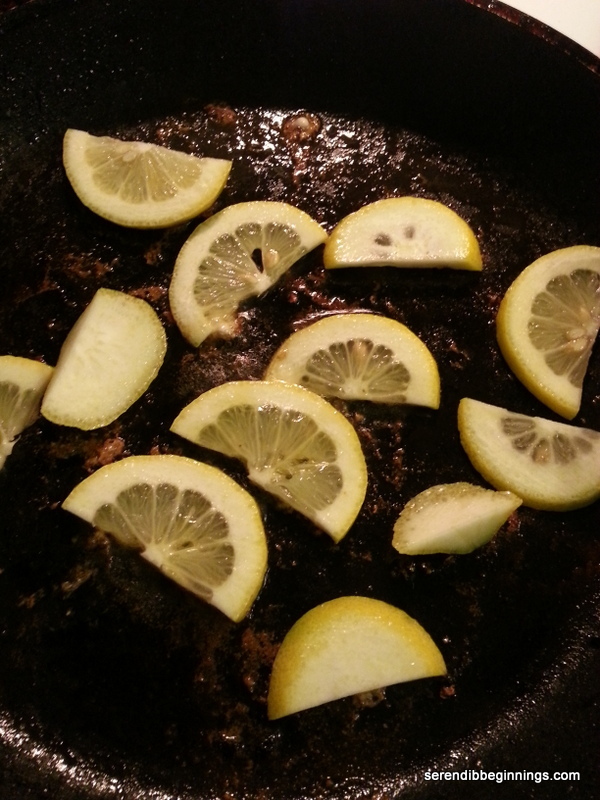 Heat olive oil over medium heat and lightly caramelize the lemon slices. Transfer to a small bowl and set aside. 4. To the pan, add the chicken pieces and brown them on both sides. Transfer to a plate and set aside. 5. Add a teaspoon of additional oil if needed and sauté the onions and garlic till onion turns translucent and starts to turn golden. 6. Add back the chicken pieces and a cup of water or chicken broth, making sure to scrape off all bits from the pan. 7. 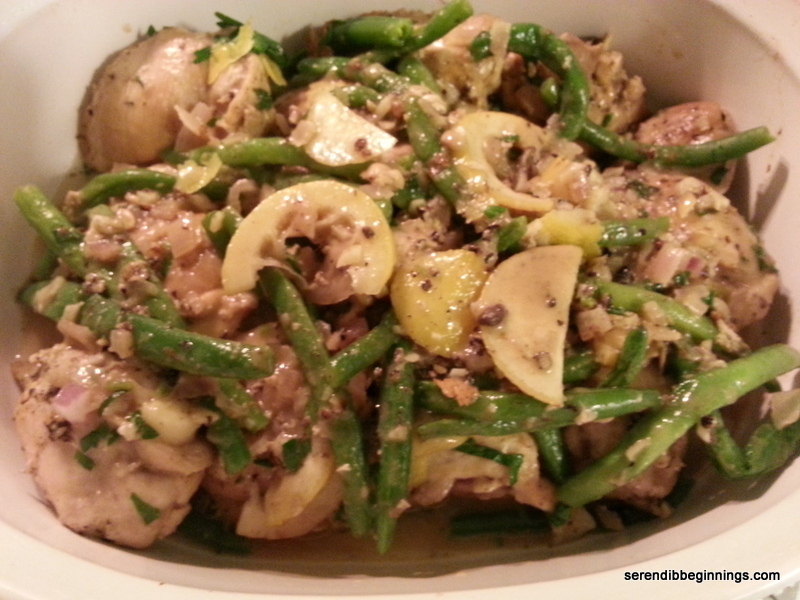 Cover and let cook for 30 – 35 minutes till the chicken is cooked through. 8. Add the trimmed green beans, lemon slices and juice from remaining half lemon. Adjust salt and pepper and continue to cook for another 5 minutes. Stir in parsley. 9. Serve immediately with crusty bread. 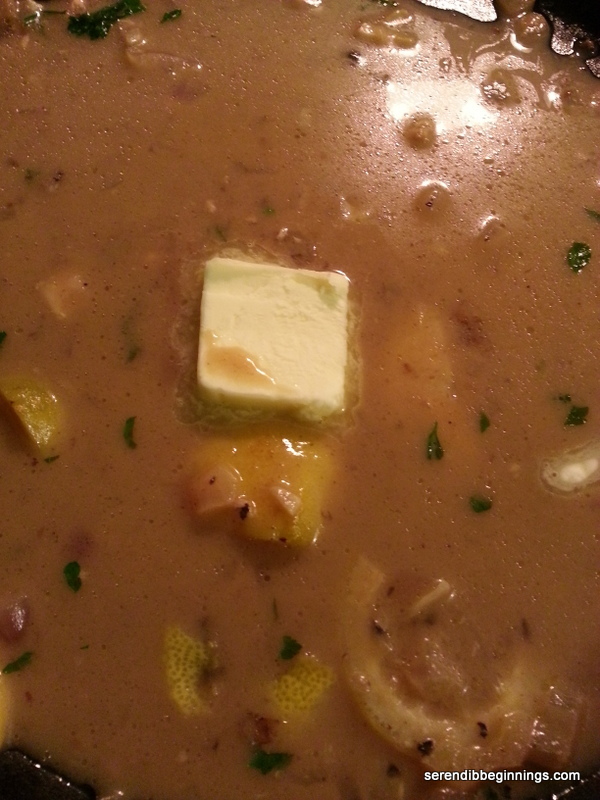 NOTE: If sauce is too thin, remove chicken and vegetables to a serving platter and continue to cook the sauce with a tablespoon of butter and/or cream for a few additional minutes till it thickens a bit. I am one of those people who loves to use up leftovers fast. If I don’t plan to use them in the next day or two, I promptly freeze them up for the following week or so. Both options come in handy when I am looking for a quick meal idea. And that’s exactly how this recipe was born! I had cooked brown rice in the refrigerator and also some leftover coconut milk. I also had a package of lean apple chicken sausage. I used to prepare more dishes with sausages but have cut down to using occasional chicken or turkey sausages. They are very handy to use in pasta or rice dishes and I usually have a package on hand. 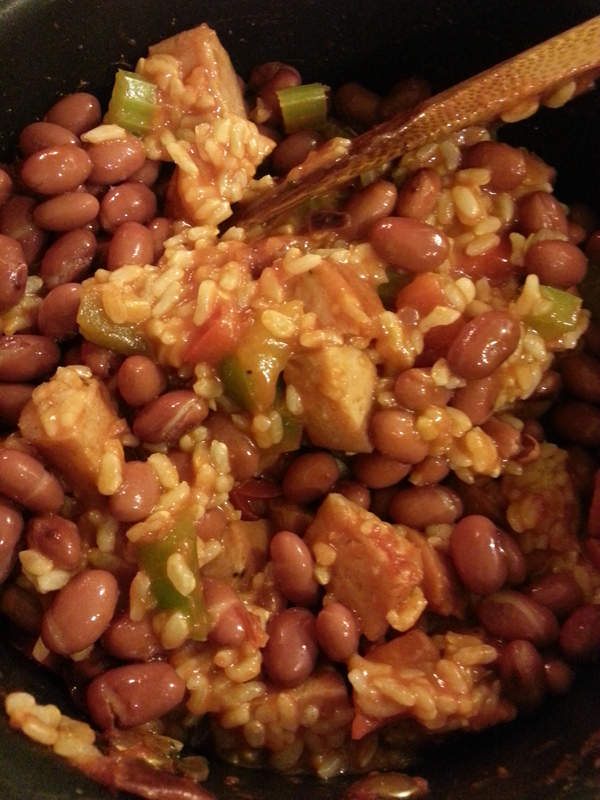 This recipe utilizes the basic trinity – bell peppers, onions and celery along with kidney beans. 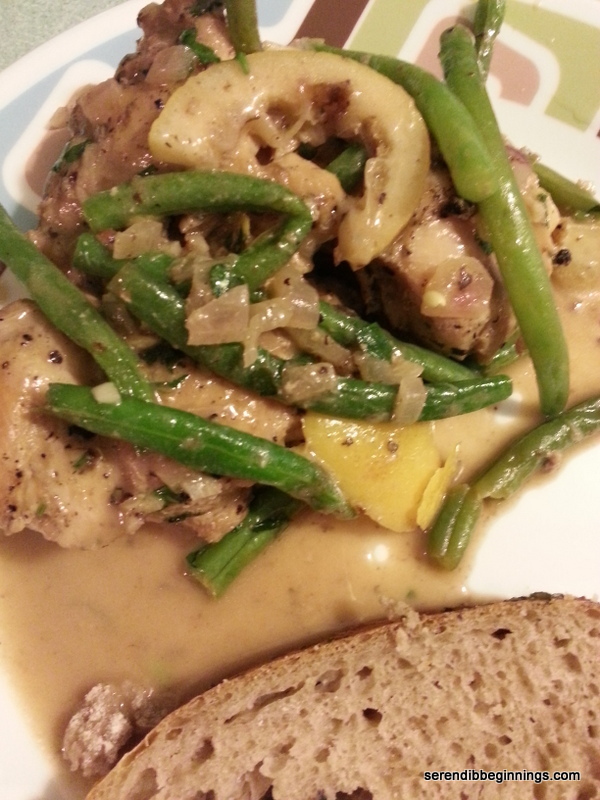 It was a snap to put together and tasted so delicious that I will certainly make it again for a planned meal as well. 1. Slice the sausages into bite size pieces. 2. Heat the oil in a skillet and sauté all the chopped vegetables, including garlic. 3. Add the sausages and sauté for few minutes. 4. 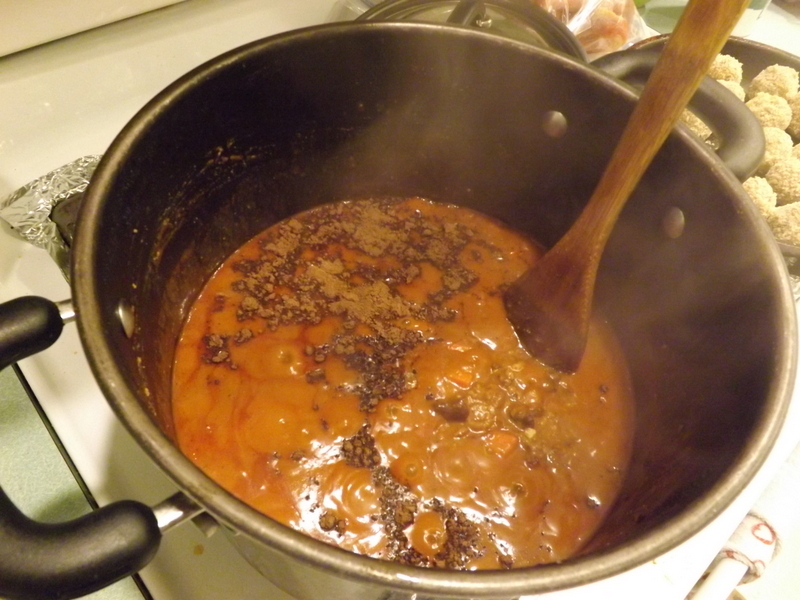 Add tomato sauce and thyme and simmer for 3-5 minutes. 5. Mix in the beans and rice. 6. Season to taste with salt. Be careful as tomato sauce and the sausage already add good amount of salt. 7. 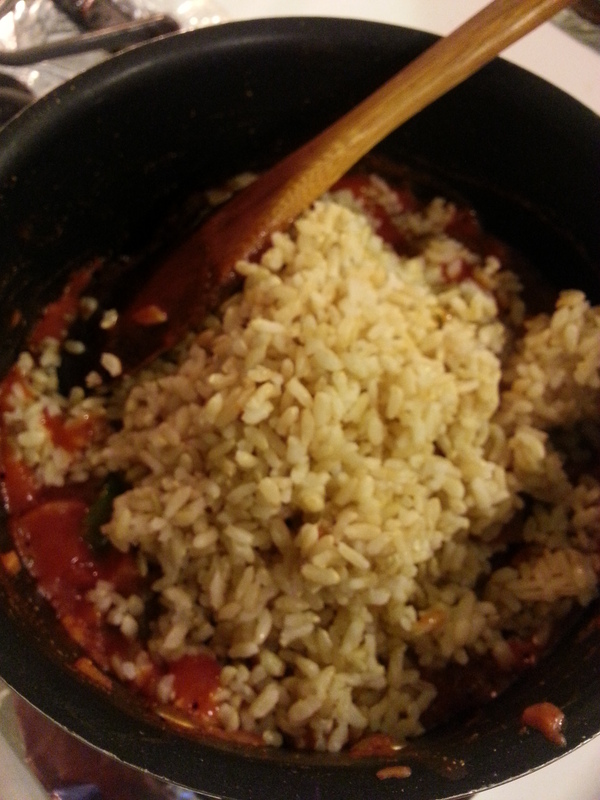 When the rice and beans and heated through with rest of the ingredients, gently stir in the coconut mil. 8. Serve immediately wit sliced avocado. There is nothing quite like a steaming bowl of chili (with all your favorite toppings of course!) to make the winter blues melt away – at least when it comes to warming your tummy! 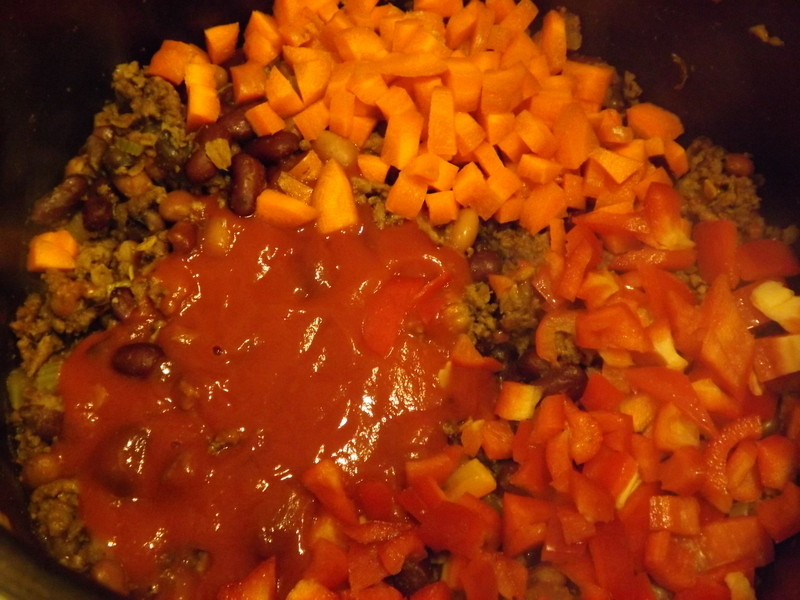 You might have your favorite type of soup/stew that you look forward to, but I kind of favor chili because I can easily incorporate veggies, beans, additional fiber in the form of my secret ingredient (yes, I will disclose it pretty soon here) and also a sneaky dose of antioxidants (hello cocoa!). Chili receives a mixed reception in my household! My kids usually whine “why??! !” when I tell them I am making it but usually polish off their bowl – even if half-heartedly at times! May be that goes back to one of my earlier posts about eating habits forming early in childhood. 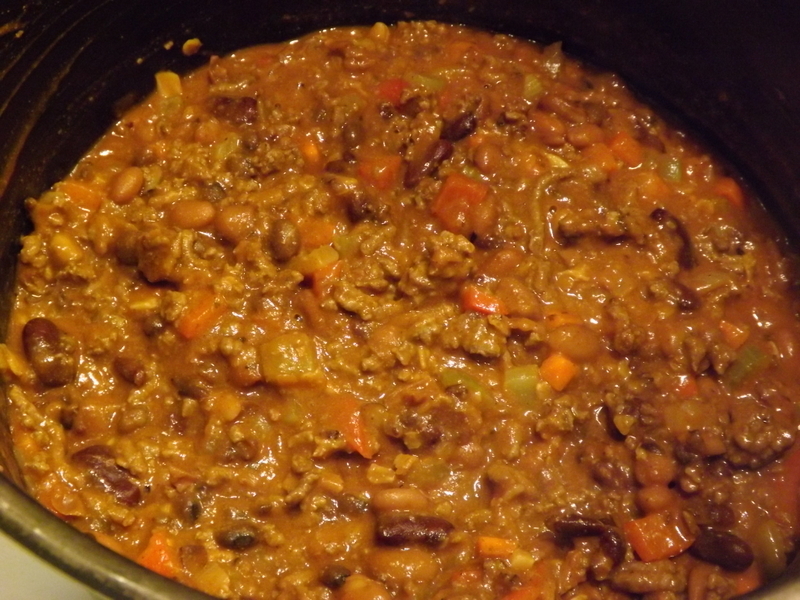 Despite their little whimper about not wanting any chili, I proceeded to make some the other night because I had all the ingredients on hand and I will be able to whip this up rather easily to share with my neighbors (you may remember that I was going to share some with them for helping us clear the snow). I really prefer to go the route of made-from-scratch rather than semi-homemade.  I think you can be much more creative with using things on hand and coming up with something quite unique and delicious. So, except for couple of canned items, most ingredients are freshly prepared. Before you go to the list of ingredients, here is a disclaimer. 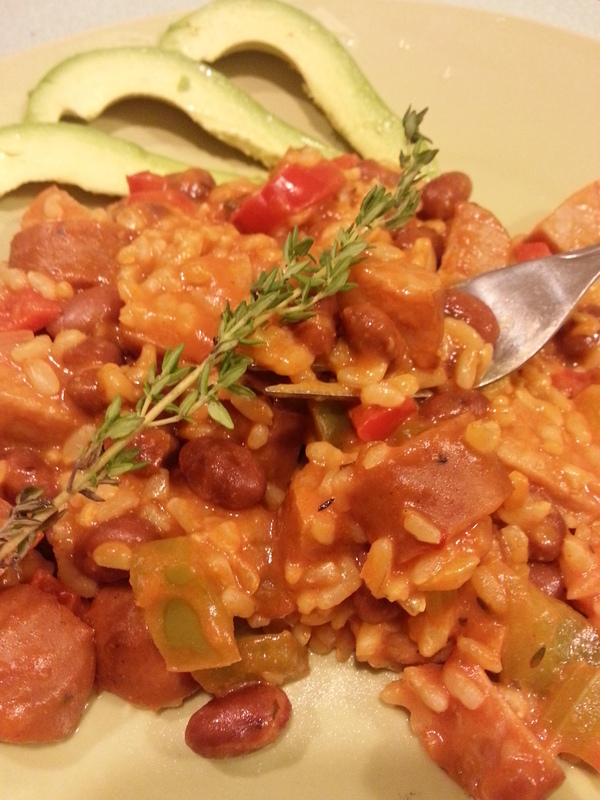 Do not let the rather longish list discourage you from trying out this recipe. 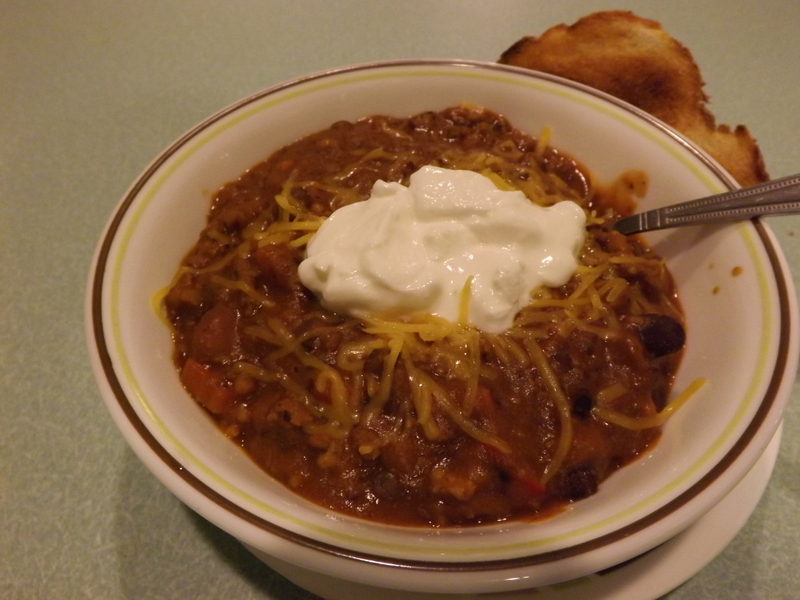 Once you prepare the ingredients, it is really a snap to put it all together – and you will be glad you did when you savor the first spoonful of this delicious chili with your favorite toppings! Thanks for still hanging in there. 1. Start by preparing all the vegetables, including garlic and cilantro. Have your seasoning containers laid out or even better measured out. Now you are ready! 2. Heat a large pot over medium high heat and brown the meat for few minutes (about 5 minutes or so). 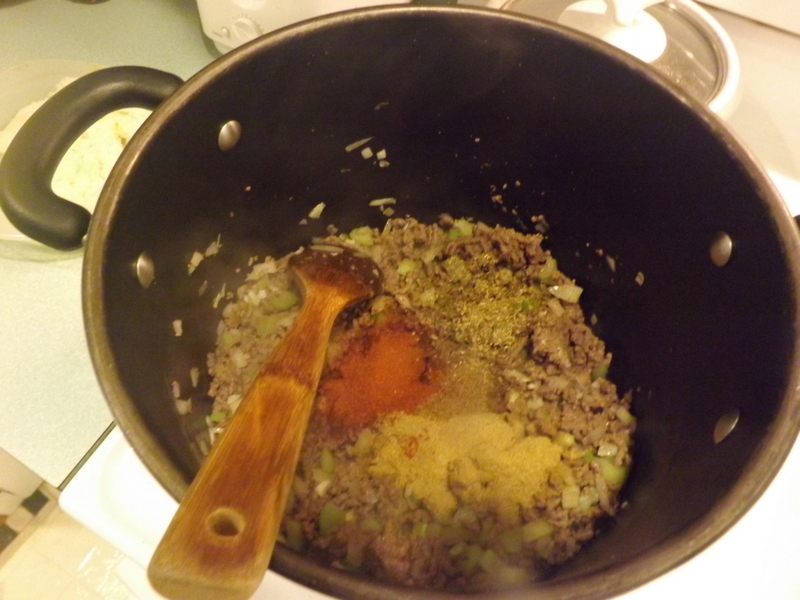 To that add the onions, garlic and celery. 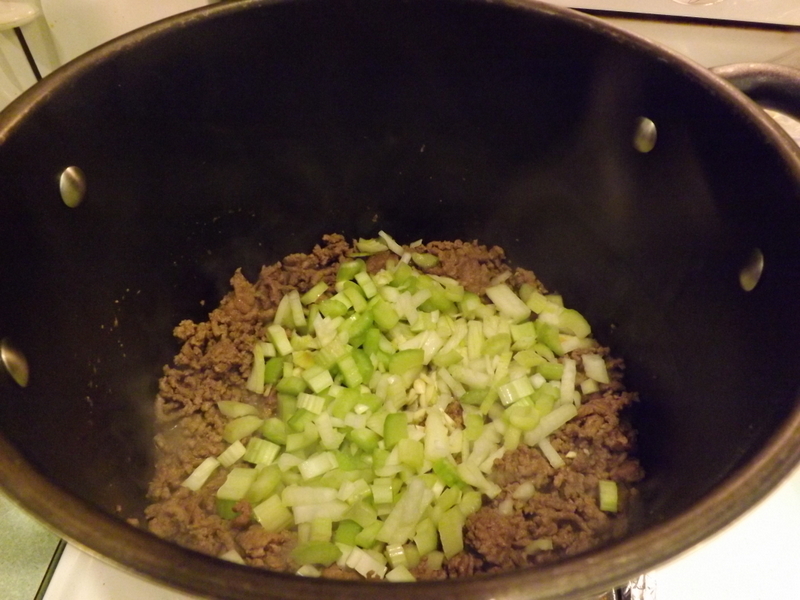 Saute for few minutes till onion and celery become a bit soft. 3. 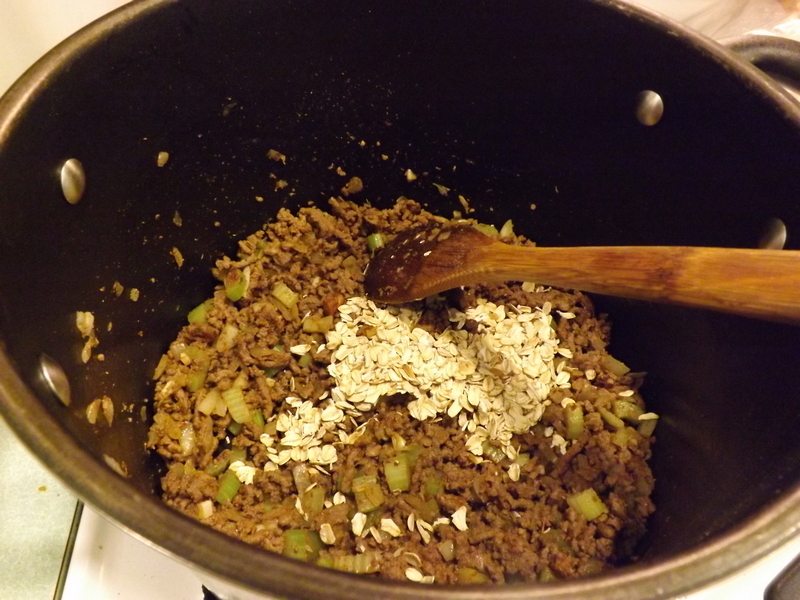 At this point, add the oats and toss them around. Follow with the ground spices, herbs and salt. 4. 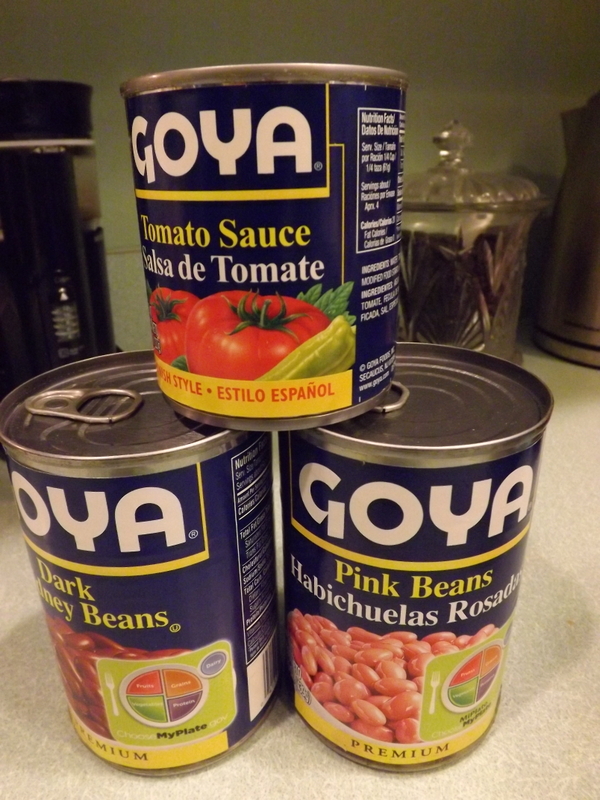 Drain the canned beans and rinse well. Add them to the pot and stir briefly. FYI, in the picture below, you will see some strange brownish beans. These are brown pigeon peas leftover from another recipe the previous day and I just used them up as well. 5. At this point, you are ready to add rest of the chopped veggies, tomato sauce and chipotle. 6. Cover the pot with a lid, reduce heat to medium low setting and let simmer for about 25 minutes.Now, add the “secret” ingredient (which is not so secret anymore) and continue to simmer for another 5 minutes till all the flavors meld together and you get a delicious pot of awesomeness. 7. Serve a bowl of this with your favorite toppings – sour cream, bacon bits, cheese, green onions/chives, crushed tortilla chips or just a toasted slice of bread. Enjoy!